It happens to us all. Maybe some of us more times in our lives than others. A point in time where you lose that joie de vivre, for whatever reason. Sometimes it's obvious as to why, other times, maybe not. Such a time has come for me in my life and it seems to be affecting so many facets of my being. Including my passion for baking, and taking photos as well as generally being able to be excited or interested in just about anything. I know this too, shall pass. It's the 'how long' it will linger that is the unknown, and also the hardest part. I am wise enough to know that life is cyclical and ever changing; what goes up must come down and eventually, will rise again. It's at this point where I step onto the conveyor belt of life and let it carry me until I can step off and walk again on my own two feet, hopefully happily skipping along as I go. A couple weekends ago I loaded my two little ones into the car and made a drive north to a U-pick berry farm. It was the opening weekend and I was looking forward to getting my hands on as many ripe berries as I could. I wasn't exactly sure what I wanted to do with them, I just knew I wanted them. It turned out to be a great time to go - the weather was overcast, so there weren't many people there. 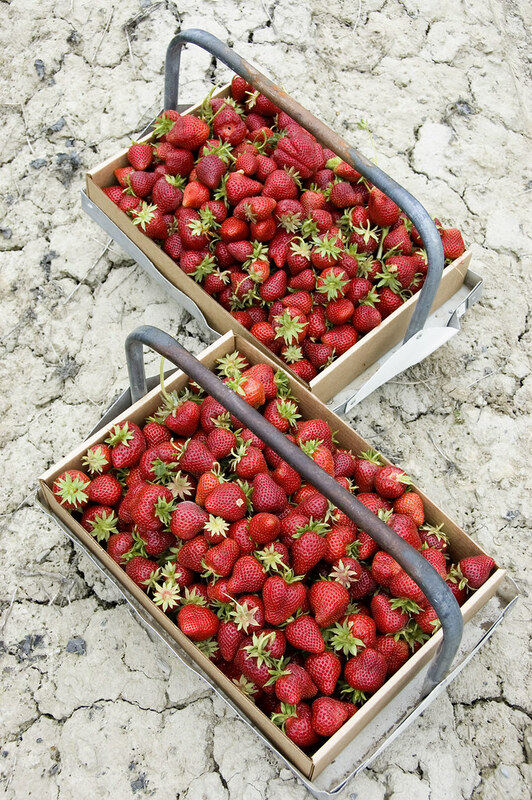 There were rows and rows of bright red strawberries just aching to be picked. It was hard to stop once our flats were full, but somehow I managed to realize enough was enough. In less than an hour we'd managed to pick 24 pounds of strawberries! Yes, that's right. 24 POUNDS! It sounds a little ridiculous saying it aloud, but it really didn't look like that much. One thing that amazed me about these berries was not only the flavor (perfectly ripe!) but the color - deep red all the way through them, not a spot of white on the inside! These put any store bought strawberries to shame in every regard. Every time I took a bite of one, I couldn't help but marvel at the beautiful color inside. Once I got home I decided I would make some jam. I've never really had much interest in making my own jam, but quickly realized, what else am I going to do with all these berries? I froze two gallon sized ziplock bags and still had several pounds left fresh. After a bit of research on jam making, I felt a little in over my head as far as canning went, but being that I have limited freezer and refrigerator space, I had no choice but to can them so that they could be kept in the pantry. I ended up just following a recipe that came with the pectin I bought to keep things a bit simpler. I was shocked at the amount of added sugar (4 cups!) especially given the perfect sweetness of the ripe berries I had, but the recipe specifically stated not to alter the amount of sugar or fruit or basically anything unless you wanted to poison anyone who came within a 10 foot radius of your jam, so I stuck with the amount called for (ok it didn't exactly say that, but it was totally implied I tell you! Seriously, you wouldn't believe the amount of italicizing, bold emphasizing CAPITALIZATION and "exact amount" talk in this Sure Jell insert. It was rather comical.). 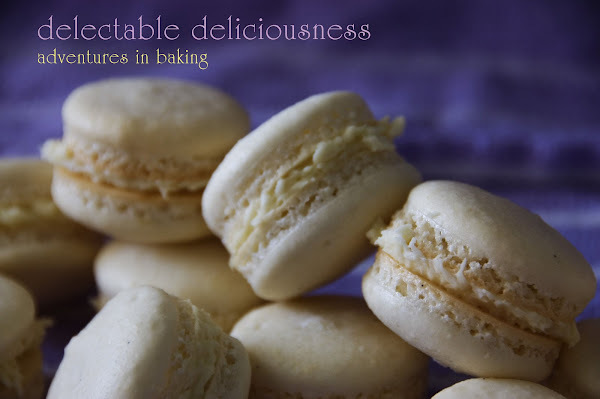 I did however add something that wasn't called for despite the recipe's scare tactics: the entire contents of one luscious and lovely vanilla bean. For some reason, I couldn't resist and I'm glad I didn't. Something about seeing those little black flecks of vanilla bean gets me every time. I just love it and I think it added wonderful flavor to the jam. I have to say, after being so intimidated by the canning process, it really isn't as bad or hard as it may seem. A bit time consuming, yes, but difficult - not really. 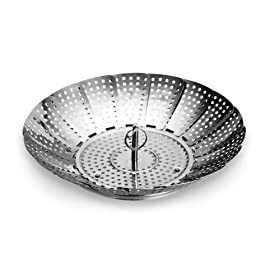 If you have a large stock pot and a steamer, you don't need to go out and get any fancy canning equipment. Tongs are probably a requirement as well, otherwise it might be quite difficult to get your jars out of the boiling water. 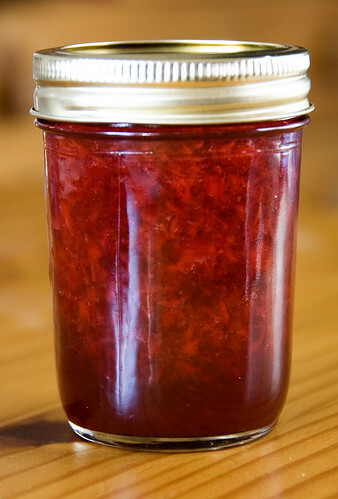 I'm happy to report that my jam turned out wonderfully! A bit on the sweet side, but incredibly good and so different from store bought jam in a way I can't quite describe. The second best part aside from the taste is the color! It's an amazingly bright, deep magenta color. So pretty. 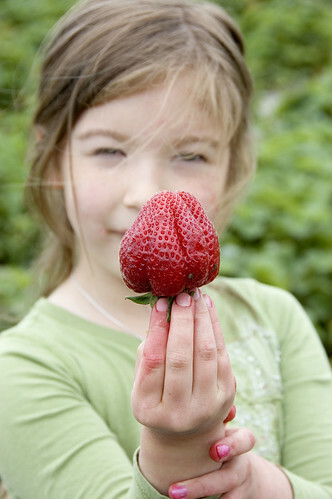 If you have a U-pick berry farm near you, I highly encourage you to check it out! 2. 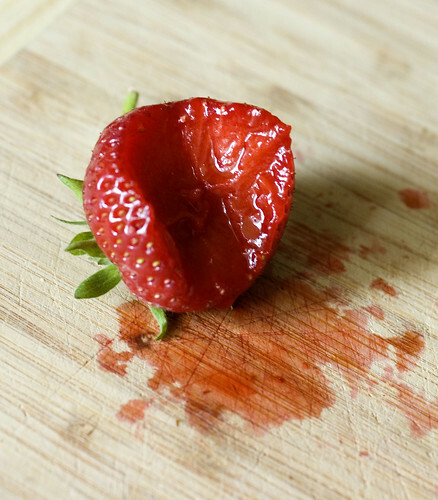 Mash your fruit; you can make it as chunky or as smooth as you like, but preferably not pureed. Add your mashed fruit to a large saucepan. 3. In a seperate bowl, combine 1/4 cup of the sugar and the contents of the box of pectin; add to the mashed fruit in the saucepan. Add the contents of the vanilla bean and stir well. At this point you can add 1/2 teaspoon of butter to prevent foaming while the fruit boils. This is optional (I chose not to do this). 4. Bring the mixture to a full rolling boil over high heat, stirring constantly. Add the remaining sugar quickly and return to a full rolling boil for precisely 1 minute stirring all the while. Remove from heat and skim off any foam that has formed. 5. Ladle into your canning jars, filling to about 1/8" from the top. Wipe off any spillage around the rim and cover tightly with the two piece lids. *Note, if you don't want to process and fully can your jam, at this point you can just refrigerate it. 6. Carefully place your jars into the large pot of boiling water (being sure to have them resting on something so that they aren't sitting on the bottom of the pot, such as a steamer basket - they won't sit exactly flat, but it does the trick) being sure the water covers the top of the jars by at least 1-inch. Cover (whoops, I totally didn't do that!) and let process for about 10 minutes. 7. Taking care not to scald yourself with boiling water, molten hot jars of fresh jam or the steam coming off the two, remove the jars from the water and let cool at room temperature at least overnight. *Note: I had to process in two batches as I couldn't fit all the jars in at once. This didn't appear to pose any problem whatsoever. By the next day, your jam should be nicely 'gelled' and thick. If it's too thin for your liking, there's ways to thicken it up, but that involves more pectin and re-processing. Hopefully it turns out just right so you don't have to go that route! One way to be sure your canning was a success is to test the tops of the jars - they should be sunken in and shouldn't make that popping sound when you press on them. 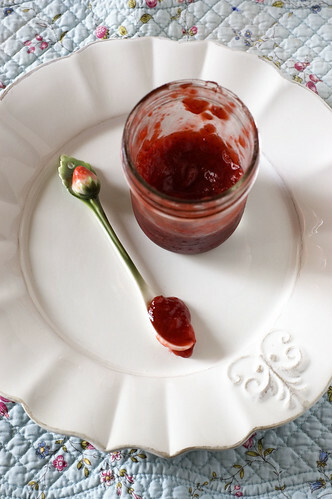 Once processed, your jam will easily keep for a year in the pantry. Your photos are delicious..just perfect.You are very talented! I'm sorry about the way you are feeling..but you are right..it must happen to everyone sometimes.. I much prefer the Joie De Vivre moments. I hope my sincere words on your great phtography .. sent you a bit of JDV..
That little face gave me some:)I love kids. I wanted to drop you a line after seeing a comment you posted over at Food Bloggers Unite! I recently launched a website (TasteStopping) that publishes photos of food that have been rejected by Tastespotting or Foodgawker. It’s a lot of fun. I hope you’ll come by and check it out. Looking forward to hearing and seeing from you soon! oh my gosh. strawberries. 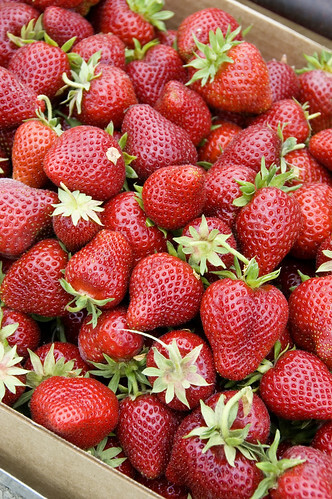 fresh strawberries. large beautiful strawberries! the first photo made me happy enough, and then you had to show the half eaten one, then the cut ones, then the canned ones... oh yum yum yum! thanks for sharing such loveliness! 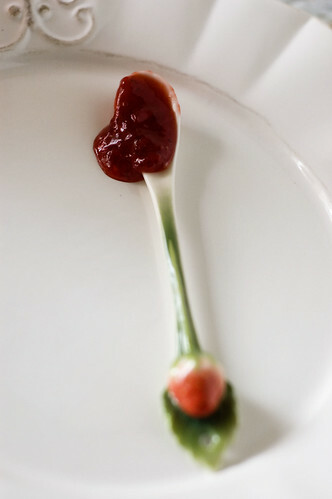 Anther great thing about strawberries..most look like ♥s..
Those strawberries look perfect! 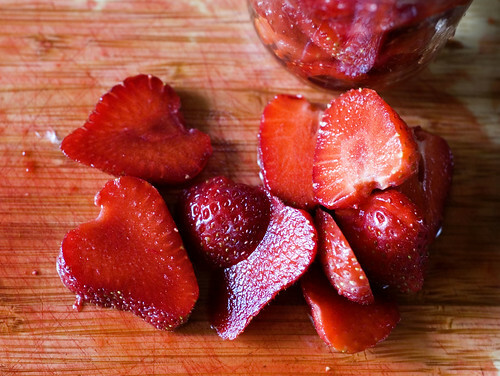 I am going to have to try adding a vanilla bean to my next batch of strawberry jam. I always have a hard time adding as much sugar as is called for. I've actually added less before and ended up with a delicious jam. And I did peach vanilla jam a few years ago and LOVED it. Don't know why I didn't think of strawberry. Wonderful!